We work in a collaborative process with your existing trusted advisors. If you need a referral we have a team of professional advisors (CPA's, Attorneys, Business Advisors, Real Estate Agents, Mortgage Brokers, Insurance Agents) that we have worked with for many years that we can introduce you to. Below are some of the advisors we work with on a regular basis. Be sure to let them know we referred you to them. 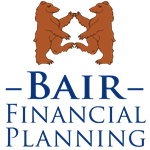 *None of the above named firms are affiliated with, nor endorsed by, Bair Financial Planning, WCG Wealth Advisors LLC, The Wealth Consulting Group, or LPL Financial.